What is the "iCourt" Odyssey project? The Idaho iCourt project is changing the way our Courts do business and serve the public. We are shifting from a legacy paper-based system to a modern electronic online judicial system by implementing integrated court management solutions and access tools. This project is in partnership with Tyler Technologies Inc., using the Odyssey software suite Tyler is a proven software company with 10 statewide court implementations and over 500 county court implementations across the country. The project is expected to take 3 years to realize statewide benefits. Once the complete system has been deployed to all counties, it will provide improved access to electronic court records, hearing schedules, court documents, e-filing and more. This new system will also provide tools to improve business practices amongst justice partners by providing around-the-clock access to court information, reduce costs from handling and storing paper files, streamline court processes, and deliver better information for judicial decision-making. 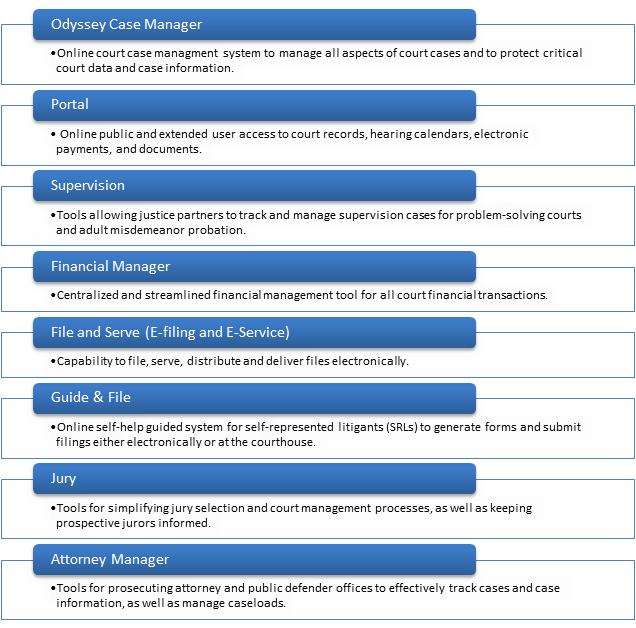 Below you will find more information about each component of the complete iCourt solution. These capabilities will be available once the statewide implementation is complete. What is the schedule for moving from the old system to the new system? 1. Twin Falls County - June 22, 2015 LIVE! 2. Ada County - August 8, 2016 LIVE! 3. Wave 1 - October 10, 2017 LIVE! 4. Wave 2 - April 9, 2018 LIVE! What specific benefits will the iCourt solution offer, once it's fully implemented? Why are we changing systems? There are two main reasons the Idaho Courts must replace its computerized case management system. The first is the Court’s aging statewide computerized case management system, Idaho Statewide Trial Court Automated System (ISTARS), has been declared by its vendor to be at “end of life.” The second reason is to meet the Court’s Constitutional mandate to “resolve court cases without delay,” a modern computer system to meet today’s business environment is a must. There have been significant advances in technology which provide tremendous efficiencies the current system cannot deliver. Recognizing the inevitable end of the existing system, and the need for significant “due diligence” relating to an effort of this magnitude, the Supreme Court established a Court Technology Committee, which is chaired by the Chief Justice and includes judges, clerks, attorneys, and administrators. With the assistance of three nationally recognized court technology experts and a Design and Implementation Committee, the Court undertook a careful analysis of the available options and concluded that a move to a modern, web-based case management system would best serve Idahoans for the next generation. Through an extensive RFP process, the proven case management software known as Odyssey by Tyler Technologies was selected as the most capable and cost effective system. Where can I find more information about public access to court records in the new system? I am a justice partner or work for a government agency that does business with the courts. Where can I find more information about extended access to court records in the new system?